Recognized as a leading authority on fitness-related information, Kathie is frequently interviewed by international and national news outlets. She has appeared on national television, including NBC’s Today Show, and has been profiled in various newspapers and magazines, including USA Today, Shape and San Diego magazines. Kathie received her Bachelor of Arts Degree in Physical Education from San Diego State University in 1979 and was awarded its Distinguished Alumni of the Year in 1993. Kathie, having taught group exercise for 10 years, maintains an active personal fitness program while visiting various fitness facilities around the country. 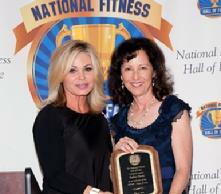 Kathie is the co-founder of Executive Director if IDEA Health & Fitness Association. IDEA is a company that creates products, tools and solutions to educate and grow the fitness industry so that they can continue to change lives, be more successful and better our world. Kathie truly exemplifies the entrepreneurial spirit. Upon graduation from college, she embarked on a journey to pursue her passion and dedicate her life’s work to what she believes in. Together with her husband Peter Davis, Kathie co-founded IDEA in 1982 on the strength on one basic premise; that by fostering professionalism in the health and fitness industry, millions of people around the world could live healthier, happier lives. Today, Kathie and IDEA continue to lead the way, guided by a common mission to create a healthier planet in concert with professionals who are on the front lines of making this vision a reality. Kathie is a key supporter and influencer of several national initiatives that contribute to conquering the global obesity epidemic including First Lady Obama’s “Let’s Move!” and “Joining Forces” initiatives.